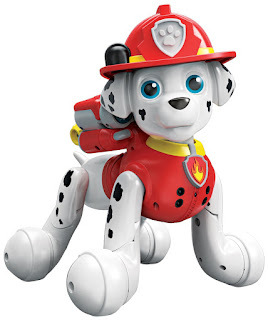 Head over to get this Paw Patrol, Zoomer Marshall, Interactive Pup with Missions, Sounds and Phrases, by Spin Master for $47.99 (Retail $69.99)! -Zoomer Marshall is on a roll! He moves and acts just like a real pup, saying 150+ real Paw Patrol phrases and sounds! -With 80+ interactive missions and tricks, including performing the Pup Pup Boogie and Paw Patrol Theme, there’s so much to do with Zoomer Marshall! -Team up with Zoomer Marshall to help find Chickeletta, put out runaway campfire coals, and more! Open up Marshall’s transforming Pup Pack to activate and launch his spring-loaded water cannons. -Zoomer Marshall is for ages 3+ and requires 4 AA batteries (not included).